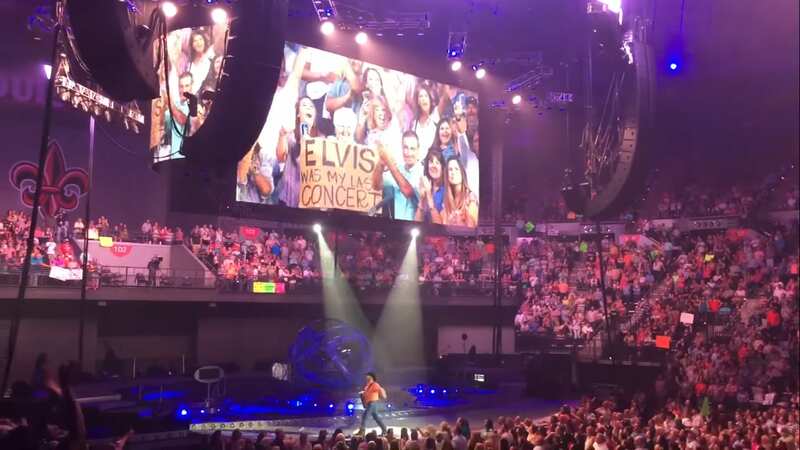 Many musicians say “I love my fans.” But Garth Brooks has shown that he puts the extra effort into appreciating the people that adore him— and this story proves it. The woman who experienced Brooks’s incredible friendliness has chosen to identify herself only as Laura and has led quite a life. She was born in the late 1920s in Louisiana and grew up through the Great Depression. She was a teenager throughout World War II. 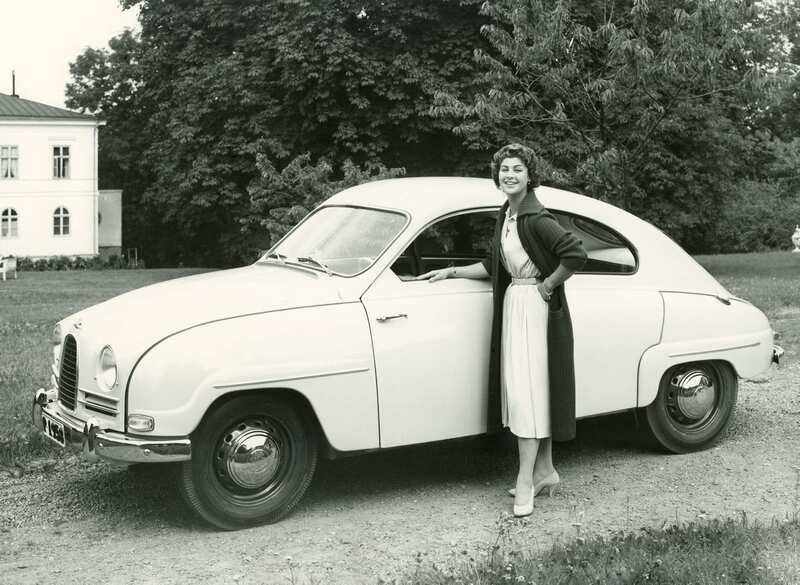 In the early 50s, she met the love of her life, settled down and had several kids. Laura is a fun-loving woman. But recently, something happened that terribly upset her. Her husband, whom she had been with for over 60 years, passed away. Luckily, Laura’s daughters and granddaughters were there to help her through this difficult time. Then the daughters had an idea of what could really cheer Laura up. 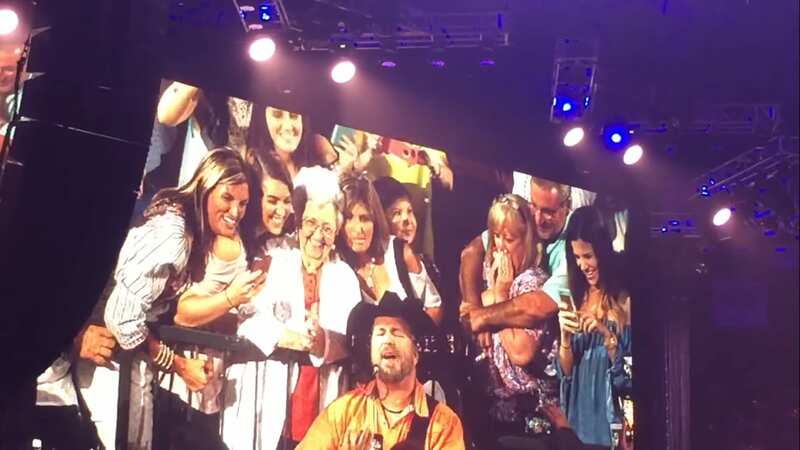 They knew that her 89th birthday was coming up— and performing in their town of Lafayette, Louisiana on that birthday would be one of Laura’s favorite musicians, Garth Brooks. Laura wasn’t a stranger to concerts. In her 20s, she used to see musicians perform all the time. But when she became a mother, concerts became less frequent. In the end, she stopped going altogether. Laura’s daughters asked their mother when was the last time that she went to a concert. 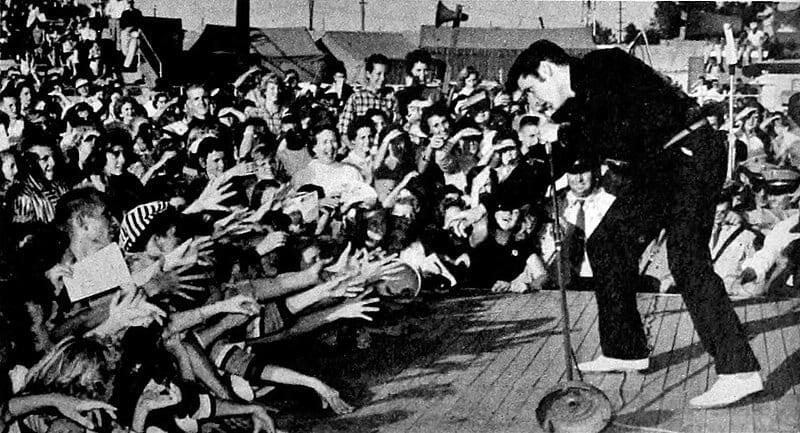 She replied that it was to see Elvis Presley over 40 years ago. 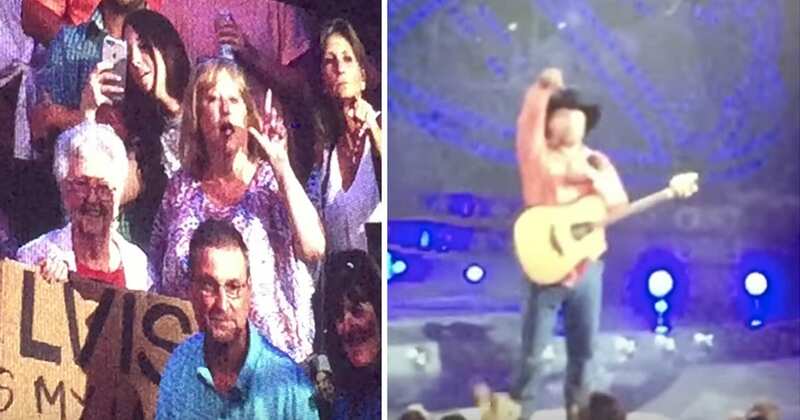 The daughters knew that they had to take her mother to see Garth Brooks. When they told her, Laura smiled and said that she’d love to go. She also knew that she could do something to gain Brooks’s attention. On the day of the concert, Laura’s daughter and granddaughter came to pick Laura up. Laura was carrying something large in her hand. It was a cardboard sign. The daughter asked Laura what that was. Laura held the sign up. It read “Elvis was my last concert.” If anything was going to get Brooks’s attention, this would be it. Later, they arrived at the concert. 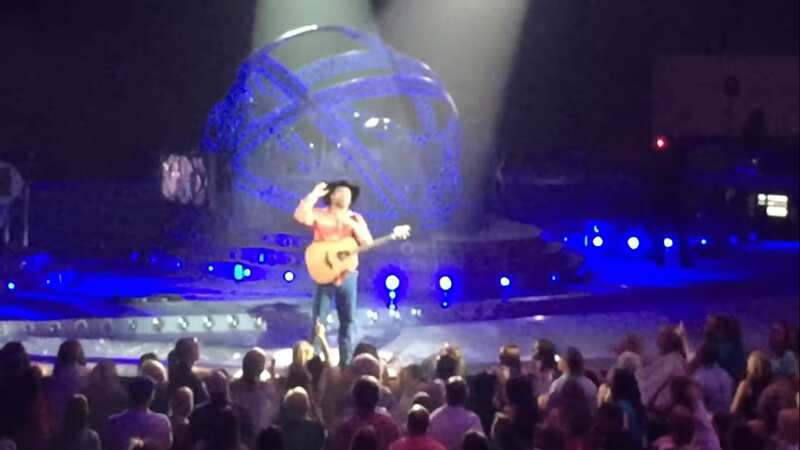 Eventually, Garth Brooks came out. He started singing his hits. But something made him stop. He looked out into the crowd and stared. Brooks decided that he had to meet Laura and make her first concert in over 40 years special. “How you doin’? You doin’ good?” Brooks said, walking off of the stage. The crowd went wild as Brooks jumped into the crowd and started to walk towards his special fan. He walked halfway through the crowd and got to her. Laura couldn’t believe what was happening. “Now they say you’re 89. You look fantastic,” Brooks said. Then Brooks had to ask about Elvis, one of his musical heroes. “Now where did you see him? Here? Oh, New Orleans.” Clearly, Brooks himself was slightly starstruck at meeting someone who’d seen Elvis perform. Instead of an Elvis classic, Laura requested one of Brooks’s biggest hits, If Tomorrow Never Comes. By this point, Laura and her daughter had already been moved to tears. 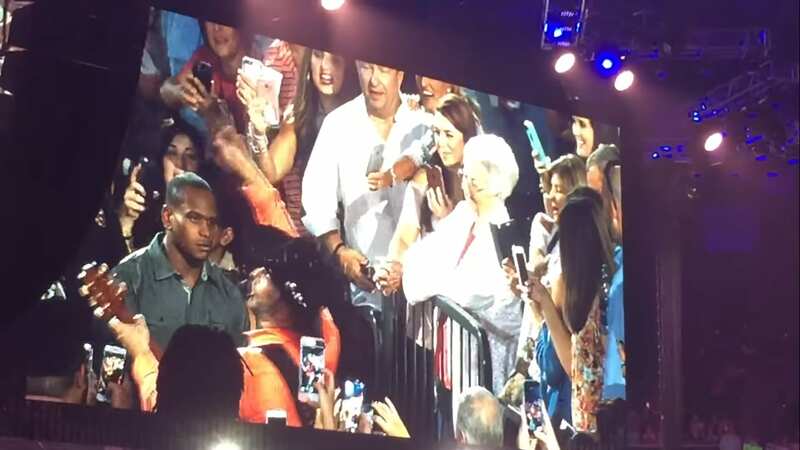 Laura’s granddaughter was keeping it together and recording the event on her phone so they could remember it forever. Everyone started singing along with Brooks. “Oh, I’m gonna start crying,” Brooks said at one point. And when the song was done, Brooks did something to make the night even more special. He took off his guitar and handed it to Laura. It’s probably fair to say that this must have been one of the greatest birthday presents of her life! Brooks walked back on the stage, knowing that he’d made Laura’s first concert in 40 years something incredibly special. If only all musicians could show as much love to their fans! Please SHARE this with your friends and family. Maxim Sorokopud is a contributor at Shareably. © 2018 Shareably Media, LLC. All rights reserved.